If you haven't binged Élite, Netflix's addictive new Spanish teen soap, you should probably get started immediately...if only so you can appreciate the importance of these dance videos. For the uninitiated, Élite is basically The O.C. meets Gossip Girl, plus murder. After their public school is destroyed, three "lucky" students are sent to study at Las Encinas, the most exclusive private school in Spain. Let's just say the students there are less than welcoming. Oh, and don't forget the murder. For those of you who have finished Élite, you're probably aching for Season 2. Sadly, while we might get more of those excellent cast videos, we won't be getting new episodes until late 2019. So, since you've already tipped your toe in the pond of the foreign teen drama, why not submerge yourself with these other must-watch, non-American series. Skins is an OG of the "teens going wild" genre. Series 1 and 2 focused on a group of friends, led by charming sociopath Tony Stonem (Nicholas Hoult). Tony and the rest of the equally troubled teens deal with a laundry list of capital "I" issues, from drug addiction to anorexia to cancer. The cast of characters change every couple of seasons, but no matter what, Skins will hook you through its incredibly watchable actors—who could resist young breakouts like Dev Patel, Game of Thrones' Hannah Murray, and Jack O'Connell? Somehow the show's gritty aesthetic always managed to anchor even the most absurd sub-plots in reality. Did you know the popular UK Netflix series The End of the F**king World is based on a graphic novel? Anyways, here is the plot for those of you who still haven't seen it: James, a 17 year old who thinks he's a psychopath, has been busy killing animals and decides he's ready to take it to the next level. He meets Alyssa, who he thinks will be a perfect first kill, until they run away together and feelings begin to bloom between them. Too bad a lot of other sh*t goes wrong on the road. Skam, a Norwegian teen drama, is particularly cool because it completely breaks the format of a typical television episode. Each season followed one character, beginning the weekly "episode" by posting clips, conversations, and social media posts on Skam's website that was put together at the end of the week. Truly a series for Gen Z, viewers also follow the characters of the show on their own various social media profiles. Skam received accolades for its groundbreaking structure and its unflinching portrayal of sexual abuse and homosexuality. While reportedly ending due to high production stress, the U.S. has picked up the popular series. You can check out Skam Austin on Facebook Watch. Set outside of London in the '90s, Rae is a 16-year-old who has just spent four months in a psychiatric hospital. When she gets out, she hides the truth about where she's been, claiming she was in France for the last four months to impress Chloe, her popular childhood bestie played by Killing Eve's Jodie Comer. If you're a fan of Center Stage—and who isn't—you'll love Dance Academy. The show centers around Tara, a girl from rural Australia, who moves to Sydney to attend the National Academy of Dance. Throughout the three-season show (plus a movie), Tara befriends her eccentric classmates, gets into several romantic entanglements, and sharpens her dance skills. For five seasons, Misfits follows a group of young criminal offenders who gain superpowers while working community service during a mystical hail storm. Imagine if a sexier, edgier X-Men merged with Skins, using its protagonists' powers as a way to delve deeper into damaged teen psyches. What do you think a quiet, awkward teenage boy would really do with invisibility, hmmm? Trust me, these kids are no Peter Parker. Miss Buffy the Vampire Slayer? Crazyhead might just be its most worthy successor. The series (which was sadly canceled after just one season) follows Amy and Raquel, two "seers" who battle demons only they can see. Raquel is a full blown, self-taught demon hunter, helping Amy deal with her so-called gift as they join forces to fight evil. 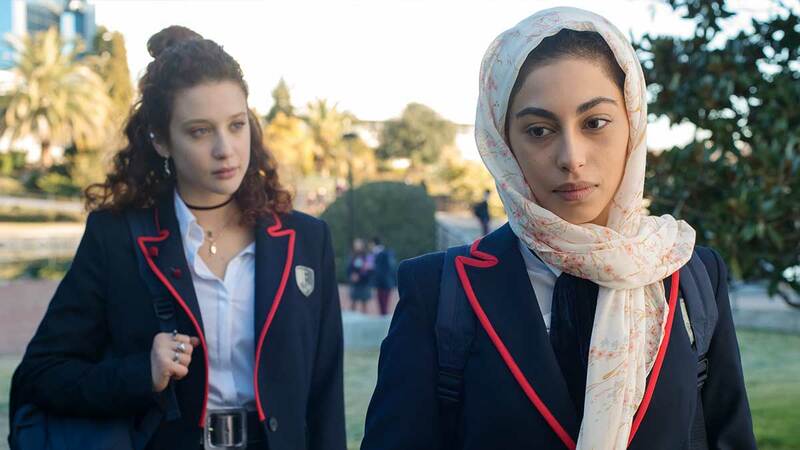 While Chewing Gum might be a little bit out of the teen bracket, it's one of the best international shows about a woman in her early twenties, so it has to be on this list. Michaela Coel wrote the series and starred as Tracey, a super horny virgin who grew up in a fundamentally religious household. Tracey is dying to know more about the world and explore her sexuality, so you can expect a lot of really relatable, awkward hijinks. From the creator of the aforementioned Skins, the British series Kiss Me First delves into the dark pit of online gaming. Leila is a lonely girl who spends most of her time online, obsessed with playing a VR game. In the game, she meets party girl Tess, who goes missing shortly after they become BFFs IRL. After Tess' disappearance, Leila goes deeper into the game to figure out what happened. Of course, what's really going on in the game is super f'd up. Think Black Mirror: The Teen Edition. Switched is a Netflix drama based on a Japanese manga series. When a popular girl Ayumi and her jealous classmate Zenko suddenly switch bodies, Ayumi is rightfully shook and determined to get her body back. But, she soon realizes that Zenko isn't going to be easily swayed into going back to her old life, kind of like a darker version of Freaky Friday. Zenko takes her "revenge" on Ayumi by living her life to the fullest, including hooking up with her boyfriend Koshiro (Jamie Lee Curtis would never).